I just finished up this front post crocheted hat using a skein of blue wool. Towards the end of the pattern, I ran short of yarn. This thick front post crocheted hat pattern is a real wool eater and I just didn’t have enough yarn in the solid blue to finish the hat. So I looked through my stash in search of a matching yarn to add to the hat. 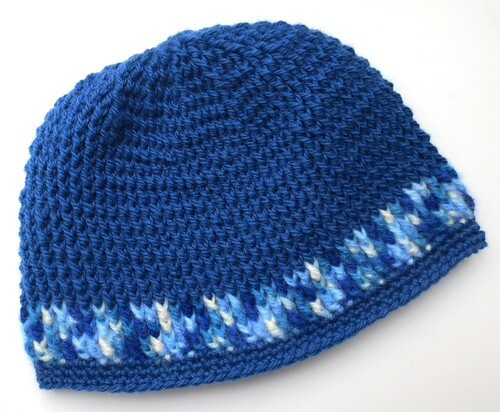 I added 3 rounds of Big Twist yarn in royal blues before finishing with 3 single crochet rounds of trim in the solid blue yarn to complete the hat. Here is a close up of the contrasting yarn I used.